Flaunt your excellent FICO credit score. (Money Magazine) -- When you've got it flaunt it -- an excellent credit score, that is. You know all too well the importance of that three-digit number, which lenders use to assess the risk you represent. 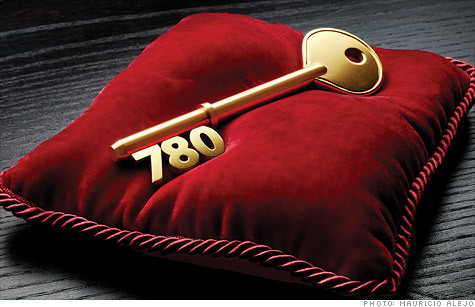 If your score is in the top tier: 750 or above out of 850 on the FICO scale. (Check yours for $20 at myfico.com.) That alone qualifies you for membership in a fairly exclusive club : Only a third of Americans have achieved such a high number. Obviously, being a member of the credit elite helps you nab the lowest rates on a home or auto loan. But it may surprise you to learn that a high score also entitles you to red-carpet treatment elsewhere. In the long wake of the credit crisis, "businesses are falling all over themselves to attract customers who are low risk," says Gerri Detweiler of Credit.com. "And they'll offer better rates, discounts, and rewards to do it." Instead of waiting for companies to hunt you down, leverage your stellar standing to score deals on these four items. Credit cards, on average, are now charging a variable annual percentage rate of 14.46%. FICO superstars can slash that in half. Simmons First Platinum Visa (simmonsfirst.com) is offering a 7.25% variable rate -- but only to people whose scores are 740-plus, estimates Curtis Arnold of Card Ratings.com. Citi Platinum Select MasterCard (creditcards.citi.com), meanwhile, is dangling 0% for 21 months to the best applicants. That's great if you're planning a big purchase: You can finance it with free money. As a high scorer, you also have access to the holy grail of rewards cards: Pentagon Federal Credit Union's Visa Platinum Cashback Rewards (penfed.org) pays 5% on gas, 1% on everything else. Credit approval rates at this national credit union -- you must be in the military or a member of the National Military Family Association, which anyone can join for $20 -- are notoriously low. PenFed won't disclose its requirements, but industry insiders estimate the credit union turns away anyone with a score below 740. That didn't happen to Faheem Walji, of Lodi, N.J., who leveraged his 750 score to get this and other highly selective cards. "Banks compete for my business," says Walji. "So I use my score to get the best possible rewards out there." Happy with your current card but wish it had a lower rate or no annual fee? With industry competition so fierce, you may be able to work your high score to get your way, says John Ulzheimer of SmartCredit.com. Call customer service and say, "I'd love to stay, but with my 780 score I can get a no-fee card elsewhere. Could you waive the annual charge?" Negotiation is the name of the game when buying a car -- and your high credit score is one of your trump cards. Many lending institutions lock dealers into preset rates, meaning they can't match what you've been promised elsewhere, says Ulzheimer. So paint the dealer into a corner by asking for a further discount on the price of the car if you take his financing. That worked for Bay Area resident Leland Lim, who had an 811 FICO score. "I chopped an extra $400 off the price of my 2010 Toyota Sienna," he says. While insurers won't disclose how heavily they weight credit history, there's no question that good credit gets you lower premiums. So if FICO has raised you by 50 points or more since you last re-upped, ask your insurer to reevaluate your rate at renewal, or shop for a better deal, advises Tom Quinn of Credit.com. You could save $100 a year. If you plan to rent a vacation property for yourself or co-sign on an apartment for a child, remember that your score will be handy in haggling here too, says Christina Aragon, director of strategy at Rent.com. Wave a pristine number in front of rental agencies and say, "You can see I'll be a responsible tenant, so can you give me a better price or waive the security deposit?" In tight rental markets, a great score may make the difference between landing a place at all or being left out in the cold. Secure that last beachfront property on the cape, and you'll have proof positive that when it comes to your credit score, it pays to be immodest. What are the best places to put my long-term savings and my ready cash?